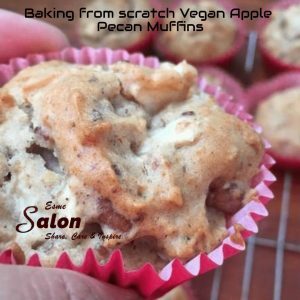 Sometimes baking a muffin from scratch can seem to be a lengthy task, but it is actually really simple so try Baking from scratch Vegan Apple Pecan Muffins. Homemade also tastes better, maybe because I am actually aware of what is going into the muffin. I mean seriously I have walked past many a bakery and seen the conditions of those kitchens and wonder if I am actually getting a muffin or am I getting a muffin and a something extra, a special secret ingredient. I am slowly working my way through my vegan muffin section of The Vegan baking cookbook and today it was the apples turn to be turned into a muffin, sorry bananas it is time you took a back seat. I love apples in all forms, shapes sizes, and colors, so this recipe was just up my street. And if the recipe itself was not a breeze to make it was also vegan-friendly so my mother could enjoy the sweet treat as well. Mix the flax seeds and water together, give it a good stir and allow to stand for 15 minutes to get all gooey and this will form the vegan egg. In a bowl, mix the applesauce, oil, sugar, vanilla essence and vegan egg together, until well combined. Add the flour, baking powder, cinnamon powder, salt and mix till well combined. Fold in the apple pieces and the nuts. Fill your muffin casings about ¾ of the way. Pop into a preheated oven and bake at 180 degrees for 15 – 20 minutes or until the cake tester comes out clean. Do you like the muffin man?